Reflexology is an ancient form of therapy that uses points on the feet or hands as a map for treating the whole body. It’s a very relaxing treatment which can relieve many acute and chronic conditions. The fundamental principle behind reflexology is that there are points on your feet which reflect every part of your body. By touching the right places on your feet a trained practitioner can produce a beneficial effect on the corresponding organ, gland, limb or joint. One great benefit of Reflexology is that it can restore balance in your body (known medically as homeostasis). This is achieved by unblocking essential pathways of energy and bringing a new level of harmony to your physiological make up. It starts with a consultation in which you will be asked about your life and medical history. You will then be asked to take off your shoes and socks and make yourself comfortable. Your practitioner will be able to ‘read’ your feet and gain more information about your physical condition. After some relaxing massage, she will then begin the reflexology itself, working first on the right foot, then the left, and concluding with a massaging technique on both feet simultaneously. Almost anyone can benefit from reflexology – from children to the most senior of us. It can be used to build up the system’s strength and counter the pressures of modern life by reducing stress and improving cardiovascular and lymphatic circulation. There are few better ways to release congestion in the nervous system and achieve more balance in your body’s energy. 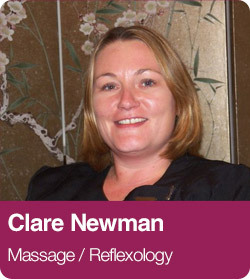 So if you are interested in reflexology, please contact the clinic for information.